$20,000 PRICE IMPROVEMENT!!! BACK ON THE MARKET!!! Home fell out of Escrow at no fault of the sellers. Turnkey pool home in the highly desirable Lyons tract community in Santiago Hills. This inviting and naturally well-lit 4 bedroom home offers over 2,400 sqft of living space, cathedral ceilings, formal living room, formal dining room and an updated kitchen with oak cabinets, granite counters and stainless steel appliances. The Kitchen opens into the breakfast nook, work station, and family room. The spac $20,000 PRICE IMPROVEMENT!!! BACK ON THE MARKET!!! Home fell out of Escrow at no fault of the sellers. Turnkey pool home in the highly desirable Lyons tract community in Santiago Hills. This inviting and naturally well-lit 4 bedroom home offers over 2,400 sqft of living space, cathedral ceilings, formal living room, formal dining room and an updated kitchen with oak cabinets, granite counters and stainless steel appliances. The Kitchen opens into the breakfast nook, work station, and family room. The spacious master suite features vaulted ceilings, dual vanities, large soaking tub and separate tiled shower. French doors lead to a very private entertainers back yard with large covered patio, heated pool, and spa. Other notable features include dual paned windows, custom shades, plantation shutters, laminated flooring, stone tiles in kitchen, artificial turf, inside laundry area, 3 car attached garage with oversized driveway, and leased solar panels which may be assumed or bought out by the new owner. 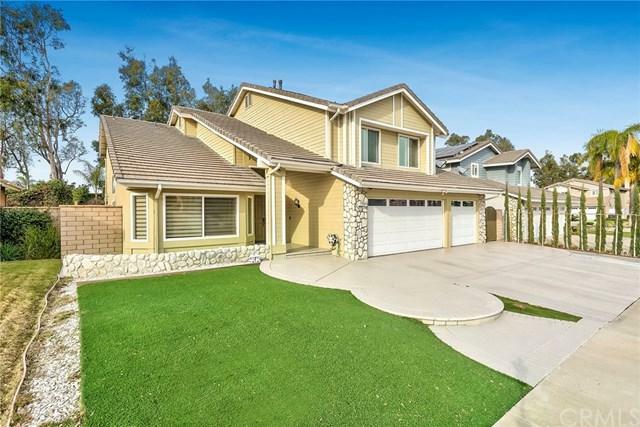 Located within minutes of excellent schools, shopping centers, restaurants, hiking trails of Peters Canyon, and the 261 and 241 toll roads. Listing provided courtesy of Berkshire Hathaway Home Svc.. Listing information © 2019 San Diego MLS, Inc.